High hopper capacities: Able to cover large areas between hopper refills. Low profile hoppers: Low filling height. Easy to fill. Drive unit is without gears or hydraulic motors: Provides simple maintenance. One piece hopper molded of fiberglass or polyethylene: Plastic construction to eliminate corrosion. Seamless for accurate and consistent emptying. Parts in direct contact with product are constructed of non corrosive materials: Helps eliminate corrosion of parts. Spreading capacity: Highly productive at 44 to 890 lbs. per acre. Pendulum type broadcast: Provides even spreading and controlled coverage up to 50 ft. effective spreading width. Pendulum system insures that the material is always spread the same on left and right side. Two position pendulum angle: Allows to increase or decrease spreading width. 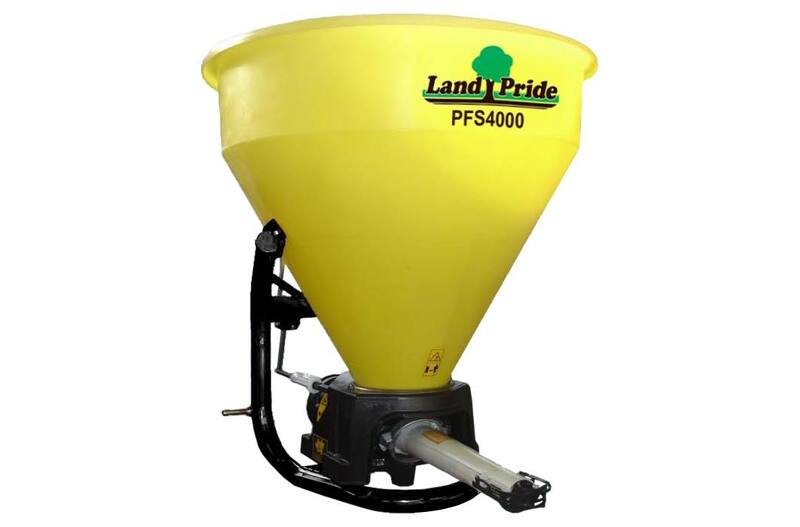 Heavy-duty tubular frame: Supports hopper weight with optional extensions when full. 540 RPM shielded PTO: For added safety. Standard Plastic pendulum spout: Protects from corrosive material to enhance longevity. Optional spouts are constructed of stainless steel to enhance longevity. Variable adjustable gate: Provides for precision control of discharge rate. Stainless steel gate: Protects from corrosive material enabling gate to operate smoothly. Plated adjustment levers: Protects from corrosive material to enhance longevity. Capacity: 13.6 cu.ft. / 925 lb. Overall height / Loading height: 47 in. Tow hitch capacity: Can tow up to 800 lb. with a maximum tongue weight of 50 lb. Working height (End of pendulum): 29 1/2 in. Effective spreading width (min.-max. ): 2 ft. -4 in. to 46 ft. -0 in. Depending on spout, material and PTO speed at 540 rpm. Ground coverage per hour - 20 ft. Effective spreading width: 7.3 to 17 acres/hr. traveling at 3 to 7 mph. Ground coverage per hour - 26 ft. Effective spreading width: 9.5 to 22 acres/hr. traveling at 3 to 7 mph. Ground coverage per hour - 32 ft. Effective spreading width: 11.6 to 27 acres/hr. traveling at 3 to 7 mph. Ground coverage per hour - 40 ft. Effective spreading width: 14.5 to 34 acres/hr. traveling at 3 to 7 mph. Ground coverage per hour - 45 ft. Effective spreading width: 16.7 to 39 acres/hr. traveling at 3 to 7 mph. 13.6 cu. ft.; 925 lb.